Founded in 1923, Ontario Motor Sales has a rich history of serving and impressing our customers in Oshawa. Giving back to the community has always been at the core of what we do as a business, and we are always keen to look to the past to see how we can better serve our community going forward. That's why, as the final entry in our summer blog series, we want to take you back in time so that you can journey with us through OMS's 93-year history in Oshawa. It's been an amazing experience doing business in one city for so long, and we can't wait to see what's in store for us next. Here's a photo of us today in 2016, in case you haven't been by since we renovated about a year ago. Note: Just click on the photos below to enlarge them. These are from our archives and chart the history of the dealership at our various lots. 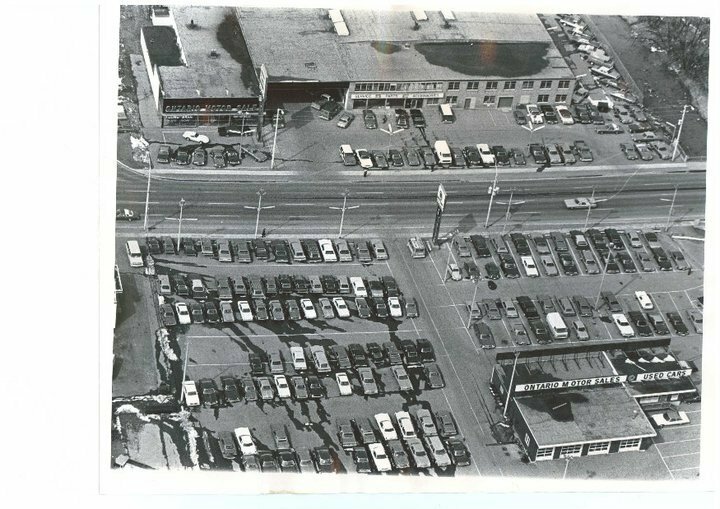 In 1928, OMS purchased land at 86 King Street E, which is currently a parking garage, as well as land at 190 King Street E. The land at 190 King served as our used car lot, and in 1931, the rest of the business (including new sales, service, and parts) moved from Simcoe Street to the land at 86 King Street. We also acquired the rights to Pontiac and Buick in 1933 after losing the phased-out Oakland brand in 1931. As with most other businesses, the dealership faced difficulties throughout the Great Depression and World War II. That said, after trudging through the depression, OMS's shop at 86 King Street was converted into a turnip-waxing facility during the Second World War. Our sales and service staff who were not fighting in Europe were joined by over 100 women who worked tirelessly to wax and package turnips to be sent overseas for soldiers. 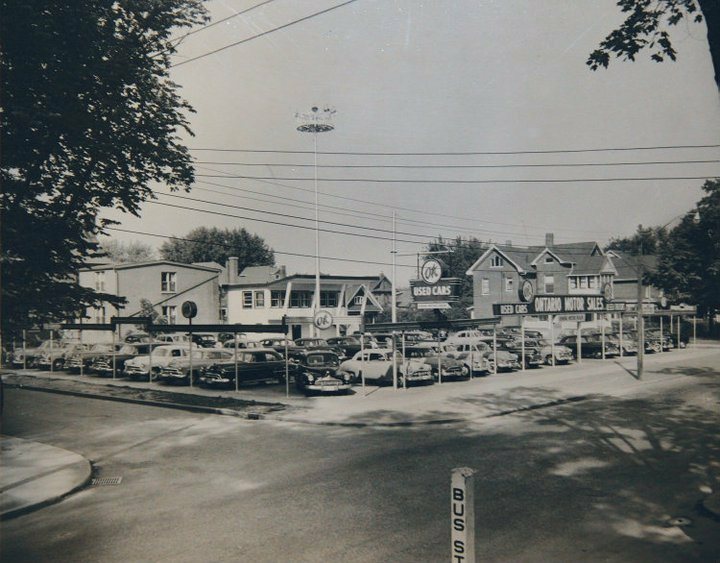 When the war ended, business picked up again, and we ended up being so busy in the late 1940s that traffic jams would often spring up at King and Mary. When the Hambly Arena burned down in 1953, the City of Oshawa initially considered rebuilding the arena in the same lot, but eventually decided to sell the land and build a new arena (now Children's Arena) to the north on Arena Street. 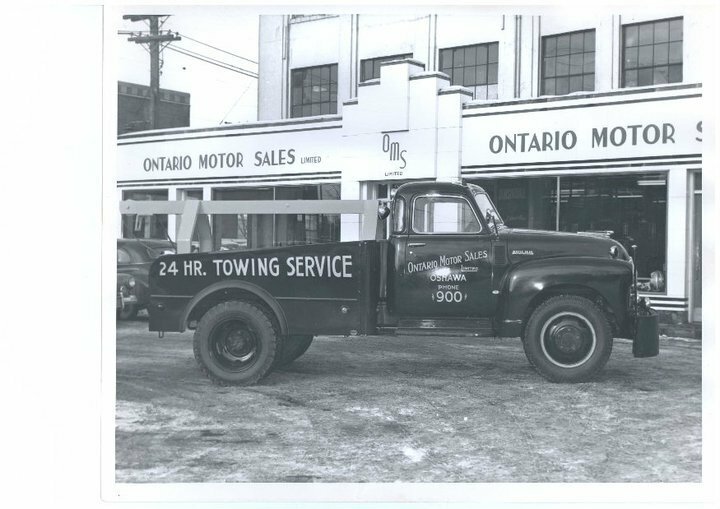 Ontario Motor Sales purchased the land at 140 Bond Street W where Hambly Arena once stood, and in 1955, all departments were moved from 86 and 190 King Street to 140 Bond, where we still operate today. Our New Sales, Service, Parts, and Body Shop departments are all located on the north side of Bond Street, and our Pre-Owned Sales Department is located on the south side. Thanks for reading! We hope that you learned a little more about our dealership. 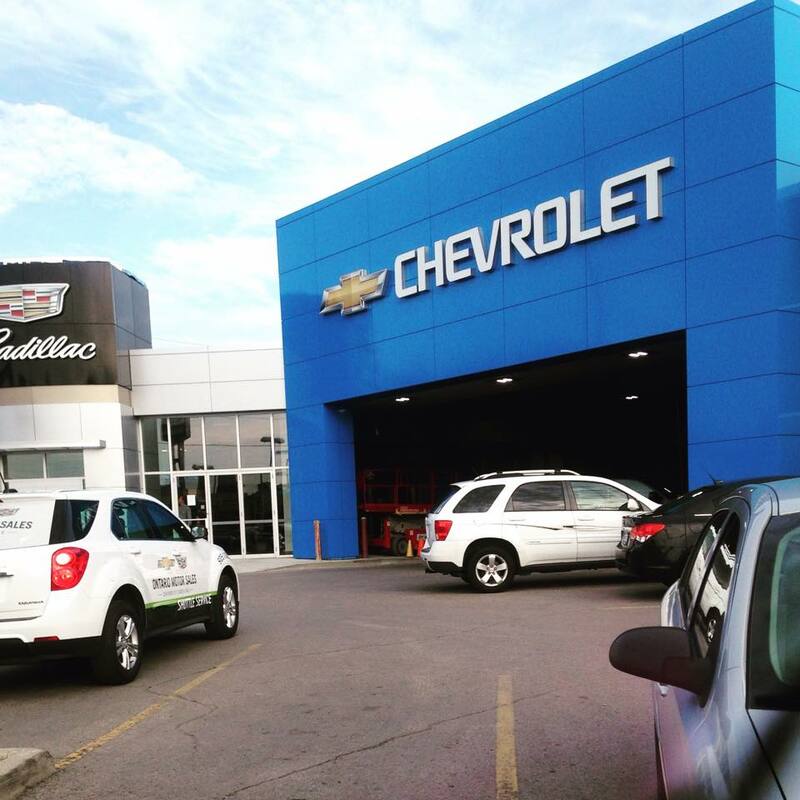 As you just read, we are located at 140 Bond Street W in Oshawa, Ontario, and we've been the city's premier GM dealership for almost an entire century. In 1977, we sold our 100,000th car, and in 2001, we sold our 200,000th. These are huge milestones of which we are very proud. With over 200,000 vehicles sold since 1923, be sure to visit Ontario Motor Sales the next time you are in the market for a new or pre-owned vehicle. Our customers are our family and they contribute endlessly to all that we are able to do in the community. We look forward to welcoming you into our showroom and Service Department for all of your automotive needs. From all of us here at OMS, thank you for your continued readership over the summer. Although this is the final entry in our summer blog series, we look forward to continuing to share news on promotions and specials with you here on our website and on our social media channels. If you haven't already, be sure to "Like" us on Facebook and follow us on Twitter for all your OMS-related news and events.